Sir Paul McCartney's Live and Let Die has been named the greatest James Bond theme in a poll of BBC Radio 5 Live and BBC Radio 2 listeners. The track, recorded by McCartney and his band Wings, received more than a quarter of all the votes. The 1973 film starred Sir Roger Moore, opposite Bond girl Jane Seymour. Carly Simon's Nobody Does It Better, from The Spy Who Loved Me, was runner-up, while Dame Shirley Bassey's Goldfinger came third. The chosen track was revealed by film critics Mark Kermode and Simon Mayo during a special Bond edition of their regular review show on Radio 5 Live. The poll is one of a number of events to mark Bond's 50th anniversary. Each of the top three tracks will feature in Radio 2's Friday Night Is Music Night: Bond and Beyond later on Friday, as played by the BBC Philharmonic orchestra. 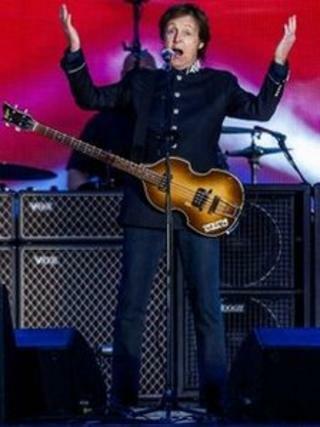 Sir Paul sang Live and Let Die at the end of the Queen's Diamond Jubilee Concert outside Buckingham Palace earlier this year.